Hey fellow H3SW team members, now we start developing this forum branch to provide effective discussions of various aspects of the project. This thread is dedicated to Graphics. Feel free to post here your assets for discussion. We will see if this thread will be enough - perhaps we will split this topic to more specific topics on various graphic assets. For now, here are the flags feanor and I made for flagged objects. Your opinions? IMO black looks good. I like both the dwellings (amazing) and the flags. I see you also featured the gray and tan colors. I must say that tan is not really working out for me, but I guess that was only for fun that you made it Both the black and especially the teal colors are very fitting. Nice to hear! Tan flag is a separate hero def flag made by Uhm back in the time. Fortunately, we are more free now in the choice of colors. Okay, I admit black looks good . Teal can be confused with blue, but I think it could stay as it is. Orange looks a bit strange to me, more brown, but maybe it's procured by dragon's red glow? I was testing our mod in HD and it seems that we can implement new interface elements by changing palette to indexed in photoshop. True, orange is darker. 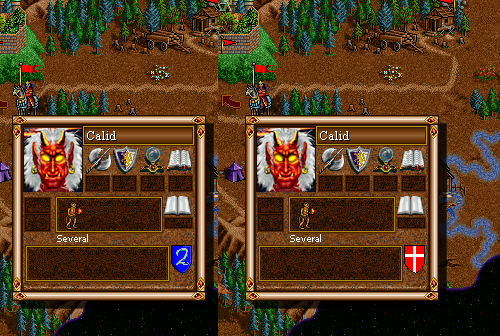 This is because of some technical restrictions because we used classic yellow flag as a mask, while classic Heroes 2 palette has a less smooth orange gradient than it is for other colors. So that it is not the same as classic orange. But I think it still looks good with this saturation. Well, I didn't doubt about HD Mod The trouble with it is that its data is loaded OVER h3sw. I will have to contact Baratorch and persuade him to add our interface pieces to HD Mod resources. I think it's possible. By the way, I think somewhat similarity between Teal and Blue can work nice for the maps atmosphere where we could add them as allies, for example. If put near each other, they obviously differ. I already had some problems in H2 with purle/blue flags, and yellow/orange/red flags. I don't know if it can have any interest for you here, but as a colour-blind, I am sure to mistake some flags. 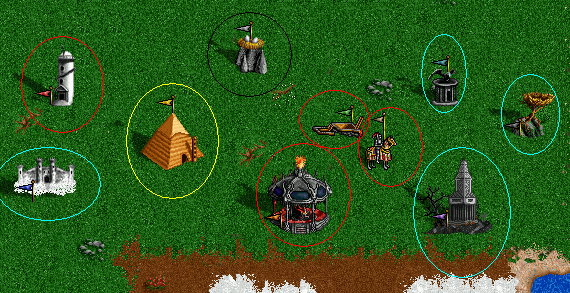 I circled in same colors the flags I was going to see in the same way. the 2 white circles of bottom are same. The 3 white circles on the right are same. (but not the left white circle with top-right white circles). That sounds bad because we don't have a solution unfortunately (especially counting you experienced troubles with the original game). The only way to determine a color will be the text panel which we have in the bottom of the screen where all object info should be displayed. I am sorry to hear about the flags being indistinguishable for you. As Orzie said it might not be possible for us to fix, while still having the colors that resemble the H2 palette. Maybe we can create you a mini mod someday with colors that you can distinguish from each other. No problem, you don't have to be sorry, the game (the world!! ) is like that. I doubt that someday there is nothing else to do than the colour-blind mod. But something that would fix colour-blind problems and be something "cool", it's giving the possibility to players to design their own flag/blazons. Or a kind of blazon that would appear in the "little popup window" when we right-click in the adventure map. ^^ somewhere the player's logo is broadcasted... For computers it would be their "player's number". We will have minimized versions of them. We might probably add the mini-versions of them to the hero info panel. I should ask feanor about such possibility. I think it will be a nice feature for everyone. This time I would like to propose this kind of placeholders for v0.8. Just because we don't have fancy graphics for all dwellings but it would be nice to save functionality of maps for v0.8, I thought it could be relevant to put these neat placeholders on the maps. 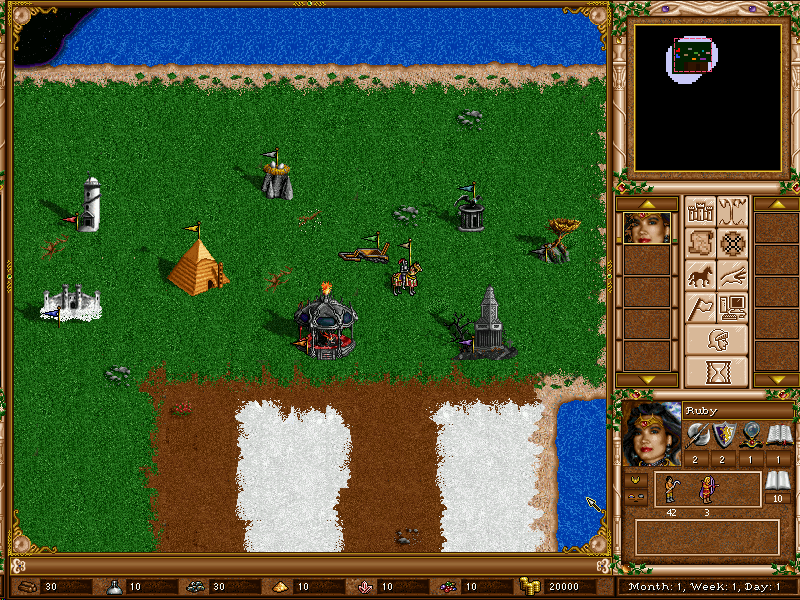 They must satisfy the 2-square passability rule (left square red, right square yellow), have a humble shadow and a clear text marker describing the faction and creature tier. The advantage of this decision is that we will clearly position these as placeholders (rather than FINAL GRAPHICS) to users so there will be no trouble with explanations like it was before. Also, the maps we convert and create will not be broken when we will replace these objects with new H2-styled graphics - there will be no need to delete and add objects to Objects.txt. The new fancy flag we created will be present so it will not ruin the gaming impressions so much. If the team is okay with this idea, I will prepare a template for all factions so we will be easily able to pack these for all vacancies. Also if I am supported in this, I will work more on the sphere and give it proper color transitions. Currently it's a rough draft. I got my full support on that. It already looks good, but neither the black or white text looks proper on the sphere, but I am not sure it can be done better though. The oceans are bugged. We must re-make the plugin because the colors have wrong cycling ranges, and the water def file should be also recompiled. But yes, the first look after non-animated oceans was also amazing. Also the new font and interface! Uhm did an amazing work on that! It is all so gorgeous! The idea is very good, but I thought that the swordsman dwelling needs only cosmetic changes, doesn't it? The more hi-quality graphics we have, the better. I would only add more smooth color transitions on the roof: just compare with original dwellings. Aside from that, looks very good. Okay, tomorrow I will prepare a PSD file with all possible dwelling placeholders so we will be able to fill the space. The text color should be brighter I guess. Mansion... Brrr, for me it was always the most darkling place in Necro town. Looking very neat! I would like only to upscale it a little - there is currently too much details for such a small structure. But I enjoy it a lot already. Feel free to use all 2 squares - you have 64 pixels in width to operate. Remember the original 2-squared dwelling - the Ruins, they are considerably larger in size. Also, in future we can consider a small angle change, to provide its diversity from the original HotA structure. I've got very good news: after hours of hard work we've managed to add to the maps editor all objects known from original H2 with proper shadow! Moreover there are dozens of new objects, some of them made from draft, several converted from H1 and H3 and some adapted from palm Heroes. Dear members of SW team: if you will have an idea what can be added or should be fixed, please, write it here. I will be working on new dwellings now. And probably monster's shadows. For v0.8 I also thought about all 8 garrisons of both horizontal and vertical form. If we will make all 8, we can add them to the Castles objects type list. What is urgent is the new mounrains for Sand (underground and surface mountains). I have asked Fred79 for help with the surface mountains, but currently we don't have underground mountains in development. There are too much organization problems for me currently, I still have to fill the Development Board, attract new forum members, direct new recruits and return to the Knight Townscreen, so I don't know when I will have time for them. Looking unexpectedly good. I must note that we are likely to have new multi-colored fonts later which will be 10 times more awesome. It;s a bit hard to read the flag colors now especially in the windows where all 8 flags are present simultaneously, but that's a trouble of a flagstaff more than of actual flags. I would suggest a more complex filler for the new inactive interface parts, based on the Good Interface beige patterns with all those gemstones and twirls. This would make the interface whole, even better than those for classic Heroes 3 + HD.